Manutec has released a new heavy duty 2.5 tonne adjustable drop leg side wind (wind up jack) stand for heavy trailer and agricultural applications. 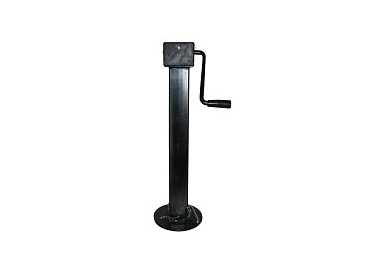 The heavy duty adjustable drop leg side wind jack stand has a 2500kg static load rating, a lift of 240mm, a drop leg extension of 280mm and a drive ratio of 2:5:1. The jack stand is coated in High Quality Black Super Zinc which is up to five times more corrosion resistant than standard Zinc coating. A Heavy Duty Swivel Mount Tube to suit is also available. Manutec has released a Heavy Duty Mounting Tube (Swivel for Adjustable stands) to suit the newly released ASSW-HD (Heavy Duty Adjustable Sidewind Stand – 4000kg rating) The AS-MTHD is a two piece weld on swivel tube with locking pin. It is also available in a 4 tonne non-drop leg version, the ASSW-HD.